Aims & Objectives: This quality improvement project plan was created in part fulfilment of the MSc in Physician Associate Studies. It concentrates on improving waiting times for new ENT patients by the creation of a non-physician-led ‘microsuction clinic’, which aims to streamline patients requiring regular care. 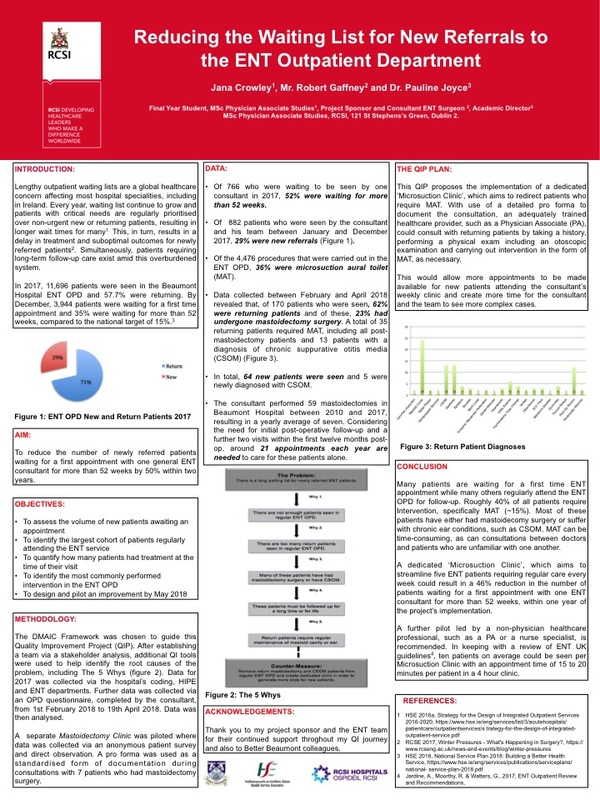 The objectives were to Investigate the volume of new patients awaiting an appointment, to identify the largest cohort of patients regularly attending the service, to quantify how many patients had treatment at the time of their visits and to identify the most commonly performed intervention and to design an intervention and pilot an improvement by May 2018. Methods: Data was collected retrospectively for 2017 by liaising with the coding, HIPE and ENT departments. Prospective data was collected via an OPD questionnaire from 1st February 2018 to 19th April 2018. A pilot of the improvement was carried out on the 26th April and data was collected via an anonymous patient questionnaire and by observation. Outcomes: In December 2017, 3,944 patients were waiting for a first time appointment within the service. Of these, 766 were waiting to be seen by just one consultant and 399 were waiting for more than 52 weeks. Of the 882 patients who were seen by the consultant and his team between January and December 2017, only 252 were new referrals. Of the 4,476 procedures that were carried out in the ENT OPD, 1,614 were microsuction aural toilet (MAT). Data collected between February and April 2017 revealed that of 170 patients who were seen, 106 were returning patients and 24 had undergone mastoidectomy surgery. A total of 35 patients required MAT, including all post-mastoidectomy patients and thirteen patients with a diagnosis of chronic suppurative otitis media (CSOM). 64 new patients were seen and five were newly diagnosed with CSOM. The consultant performed 59 mastoidectomies between 2010 and 2017, resulting in a yearly average of seven. Considering the need for initial post-operative follow-up and a further two visits within the first twelve months, around 21 appointments each year are needed to care for these patients alone. Conclusion: By assigning a dedicated healthcare provider to a dedicated clinic for patients who require MAT, patients could experience better continuity of care and faster access to appointments. Based on data collected during a pilot of the proposed improvement, redirecting five patients who require follow-up after mastoidectomy surgery from the consultant’s weekly clinic could result in a 46% reduction in the number of patients waiting more than twelve months, within one year of the projects implementation. Simultaneously, return patients could benefit from improved continuity of care and faster access to OPD follow-up. Presented at The Annual Translational Research Awards 2018 in Beaumont Hospital, Dublin.